We couldn't drink from the same water fountain or use the same bathroom when we stopped at a service station." 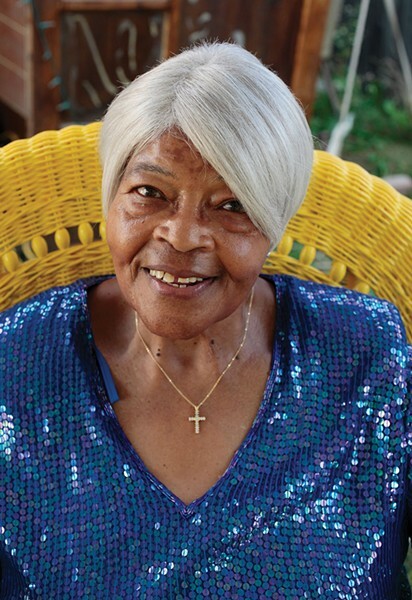 Over tea in a midtown Kingston coffeehouse, Rene Bailey is remembering her teenage years touring the segregated South in the 1950s as a member of the Gospel Light Singers of Moultrie, Georgia. "And, of course, we couldn't eat in the same restaurants or stay in the same hotels [as white people], either," she further recalls. "So when we performed at the churches in the little towns we visited the people in the congregation would put us up for the night. And they would feed us, too. They would make these wonderful dinners for us. But really our singing was our food. As long as we could sing and serve God we knew we were heading in the right direction." Looking into the loving eyes of this sweet, grandmotherly lady, listening to her laugh, hearing her passionate singing, and picturing her as a young woman, it's impossible to imagine how anyone couldn't love her right back. Or how an entire society could deny her dignity—and that of millions of others, theirs—simply because of race. A week after our conversation come the horrific, shameful events in Charlottesville, Virginia. His heart filled with sadness and rage, your music editor's thoughts immediately return to his meeting with Miss Bailey, and the elegance and profound lack of bitterness in both her demeanor and her uplifting music. Born just north of the Florida state line in Valdosta, Georgia, Bailey was the third of four children (three brothers; two older and one younger) and grew up two counties west in Thomasville, where her mother was a hotel cook and her father was a barber. "He would barter with the customers sometimes if they didn't have the money," she says. "Maybe they would bring him a bag of flour or a bag of sugar instead." Her mother's brother was the head of the music department at the town's Willow Head Missionary Baptist Church, at which she got her start singing in the children's choir and was baptized at age 11, along with her older brothers. "They baptized 23 of us on the same day," says the singer. "Everybody wore long, white robes and the preacher and the deacon brought you down in the water and then you held your nose while they dipped you in. I still remember that like it was yesterday. It was a nice family church. We sang all the old-time country hymns. I had to learn to sing the notes before I could sing the words. You know—Do re mi. Like that." After graduating high school Bailey joined the six-girl Gospel Light Singers, who were overseen by "directress" Madam Sophie Reed. Recording for the Dootone and Friendly labels, the troupe toured during the summers from Florida all the way up to Connecticut, where one of her brothers and an aunt were living. Along the way, the Gospel Lights opened for such luminaries as the Mighty Clouds of Joy, the Soul Stirrers (with a young Sam Cooke), and the Reverend C.L. Franklin and his young daughter, Aretha. By the mid-'60s she'd left the group to settle down with her relatives in the Nutmeg State, and it was there that she met her late husband, Samuel, a TV technician. "He came to set up my brother's TV, took one look at me, and said, 'I'm gonna marry you!'" a giggling Bailey remembers. "We were married within a year's time—and we stayed married for 25 years, until he passed." Although she was a member of New Britain's Union Baptist Church Choir when she and Samuel met, by then Bailey had taken a break from singing on her own in public. Yet it was her husband who encouraged her to return to the soloists' stage, this time to perform in blues and jazz nightclubs. "He didn't even know I could really sing," she says. "But when he heard me one day he said, 'This is what you should be doing.'" Many gospel-reared singers, Sam Cooke perhaps being the foremost example, experienced a backlash when they "crossed over" into secular music. Was this something Bailey encountered as well? "I didn't feel that way, because my husband and family was 100-percent in my corner. They didn't want to hold me back," she explains. "And I'd always loved to sing all kinds of songs. When I was little I loved to sing [country standard] 'You Are My Sunshine,' you know, songs like that."